Maj. Gen. Ahmed Abdullah, governor of the Red Sea, giving a signal the start of a starting Rally motorcycle fireworks from the marina tourism in Hurghada to roam all the streets of the city of Hurghada down to the tourist resort of El Gouna with the aim of promoting tourism and to emphasize the precarious security situation taking place in the city where he participated in the offer a large number of residents inside The Egyptian Arabic Republic. Governor stressed that this event aims to revive and strengthen the idea of sports for all and energize sports tourism Abdullah pointed out that the establishment of such festivals coastal preserve and share many of the foreigners is a message to the whole world that Egypt is security and safety country, wishing to establish many sports and artistic events Sea Governorate to red, indicating that the sports and art are the soft power to stimulate tourism. It is noteworthy that the number of participants in the rally racer from 60 governorates of Cairo, Suez and Port Said. 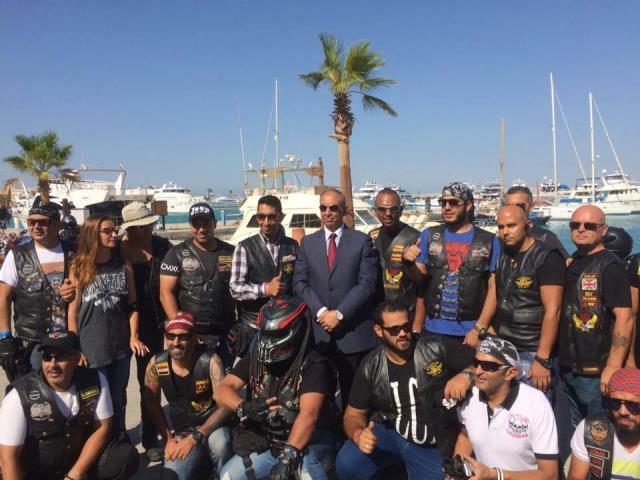 Abdullah praised the idea of a motorcycle rally, which aims to support the Egyptian tourism and preservation of the environment through an initiative based on the implementation of the Egyptian youth, which is due to roam the streets of all motorcycle motorcycle Hurghada to stimulate tourism. The young participants in the Rally to take souvenir photos with the governor of the Red Sea, presenters thanked the governor on his efforts to support the sport.